Fun Fun Fun with our new kids collection ! When it comes to gifting , we can’t deny the importance of giving gifts to kids. If there’s one person we love spending on, it’s a child. Whatever be their size and nature , shopping for kids is always fun and equally challenging. Kids don’t require an occasion to be gifted. 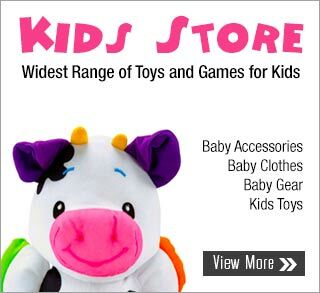 So, as you rack your brains to find the most unique gifts for the little ones, we help you select form a wide variety of choices. From leading brands like Sunbaby and Chicco , we have gifts for toddlers and infants like walkers, strollers, bassinets to daily baby care essentials. Colorful infant toys like teethers and rattlers to pull along toys will make a splash with the new born. From stylish outfits for all age group kids to fancy room decorating ideas, you can select from a variety of it . For the more playful ones , we have playsets from Barbie and Play stations , also a mix of games that provide learning and education. So send the best of gifts to the little ones now !